Come run with us on June 24! On June 24, Team VOKRA will be participating in the Scotiabank Half-Marathon and 5k run/walk and we want you to join us. It might not change your life, but your support will definitely help change the lives of the more than 1,400 kitties we rescue each year. 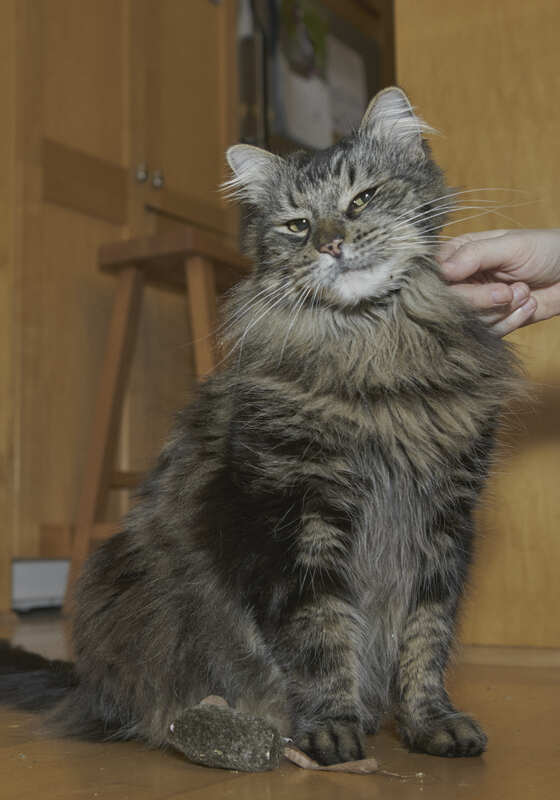 Kitties like Timmy, a handsome gentleman cat who came to VOKRA way back in 2012 after being rescued from a shelter. Timmy’s diabetic which means he needs a shot of insulin twice a day to stay healthy. It’s very difficult to find someone willing to take on a kitty with health issues, so at some shelters cats like Timmy are often deemed “unadoptable” and end up being euthanized. 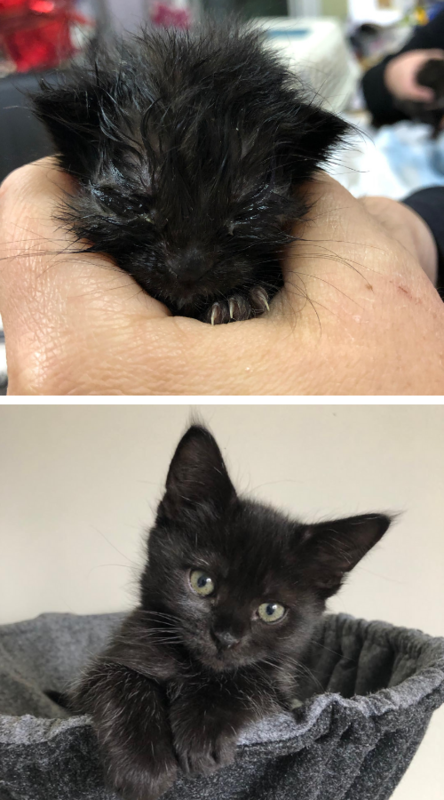 At VOKRA, they believe every kitty deserves a chance at a happy, healthy life so Timmy will stay with them for as long as it takes for him to find the purrfect forever home. It’s Time for the Great Grocery Stock Up! That can really add up fast! Last year with the help of our fosters and volunteers we raised more than $3,000 which we used to buy things like cat food, litter and flea medicine. We need to bulk buy the gift cards in order to get this special 8% return and that’s where you come in. 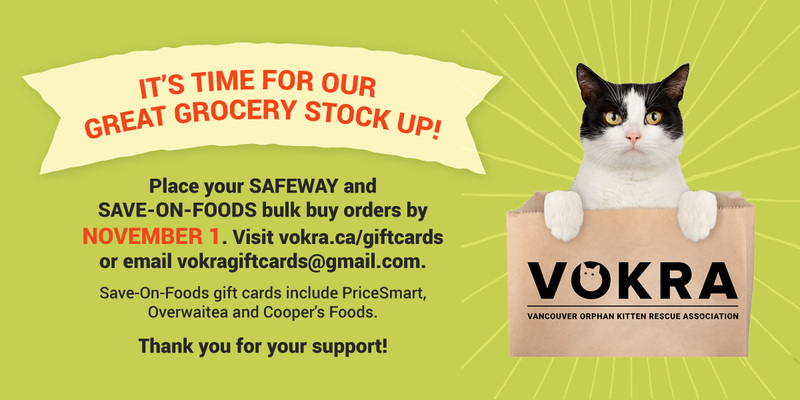 We need you to order your Safeway* or Save-on-Foods** cards by November 1. This is a limited time offer so be sure to place your order by November 1 by emailing vokragiftcards@gmail.com and let the gift card team know what you’d like. They’ll confirm your order and contact you to arrange payment and delivery. Want to know more about our gift card program? Click here. You can help us reach our goal of $40,000 in sales. That’s a profit of $3,200 for VOKRA kitties! *Safeway gift cards can be used at Sobeys, IGA, Foodland, FreshCo, Thriftyfoods, Lawtons & Needs. **Save-On-Foods cards can be used at PriceSmart, Overwaitea and Cooper’s Foods.